Two years in the making, the ProGlass IRND range from LEE Filters sets a new standard in neutral-density filters. ProGlass IRND filters were originally designed for the film industry, to meet the exacting needs of the world’s leading cinematographers, and have already been hailed as the best neutral-density filters on the market. Now, they are available to the stills photographer, in sizes to fit the LEE Filters Seven5, 100mm and SW150 systems. Advances in coating technology mean that the filters, which are manufactured from 2mm-thick, optically flat glass, are available not only in strengths of two (0.6ND), three (0.9ND), four (1.2ND) and six (1.8ND) stops, but also in ultra-long 10 (3ND) and 15-stop (4.5ND) versions. Not only this, but all filters in the range – whatever their strength – are designed to be free of color casts, with extremely accurate stop values, ensuring consistency in all shooting conditions and allowing for absolute precision when exposing images. Their neutrality also means less time spent tweaking color balances in postproduction. In addition, filters in the ProGlass IRND range are designed to block both infrared and ultraviolet pollution. As a result, blacks are rendered truly black, whites are clean, and results reveal a crispness that is second to none. The 6, 10 and 15-stop versions of the ProGlass IRND filters come with a foam seal to prevent light leaks during long exposures, and should be placed into the filter slot closest to the lens. While the 2, 3, 4 and 6-stop versions do not feature a foam seal, it is still recommended also to place them into the slot closest to the lens. All filters in the ProGlass IRND range can be used in conjunction with other filters, including neutral-density grads and the polarizer. 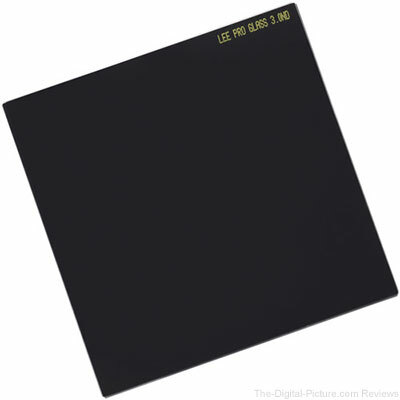 B&H will carry the LEE Filters ProGlass IRND Filters. If you are considering the purchase of a Canon EOS 6D Mark II, you may also be considering the EOS 5D Mark III as they are similarly priced with an also-attractive, mid level feature set within the confines of today's camera market. Make no mistake, these bodies are similarly versatile and capable cameras, but depending on the intended use and/or photographic challenges being pursued, either one may be a better choice compared to the other. With that said, let's look at how these full frame contenders differ. 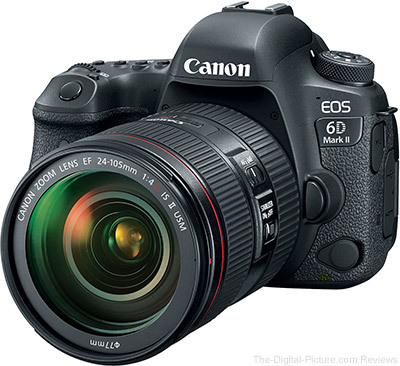 As is evident above, the 6D Mark II has more advantage bullet points compared to the 5D Mark III. However, the importance of some of the 5D III bullet points could easily sway one's decision in favor of the older, economical 5-series body. Who should opt for the EOS 6D Mark II? First of all, anyone wanting to quickly create high quality videos with their DSLR will likely prefer the 6D's Movie Servo AF – thanks to its Dual Pixel CMOS AF sensor – as well as its vari-angle LCD. Another nice feature that DSLR filmmakers are likely to appreciate is the 6D II's ability to create 4K UHD time-lapses in-camera, though many filmmakers will prefer to compile their time-lapses in post-processing for more control over the final video (essentially making this feature a less compelling advantage compared to the 5D III). From a video perspective, one drawback could be the 6D II's .MP4 recording format if someone instead preferred using the .MOV format featured in the 5D III. Another drawback is the 6D II's lack of a headphone jack. Even though it features fewer overall points, those shooting wildlife will likely prefer the 6D II's slightly faster burst rate and AF system capable of up-to 27 active phase-detect AF points when using lens+extender combinations resulting in an f/8 effective maximum aperture. And on top of that, Live View with subject tracking can be utilized with lens+extender combinations through f/11. In comparison, only the center AF point (with 4 assist points) is enabled on the 5D III with f/8 maximum apertures and subject tracking is unavailable in Live View. For wildlife photographers who never plan on using lens+extender combinations, the 5D III may be the better choice thanks to its 61 point AF system. But considering how often wildlife photographers utilize extenders, they will likely accept the 6D II's 45 point AF system to gain significantly more AF functionality at f/8. Those carrying their cameras long distances and/or for long periods of time will of course appreciate the 6D II's smaller design and lighter weight, including (but not limited to) those who are hiking to remote locations or traveling on domestic/international flights. All photographers will appreciate 6D II's higher resolution and longer battery life, and many will enjoy using its GPS, Wi-Fi, Bluetooth and NFC features which are all absent on the 5D III. Any photographers photographing under stadium lights will be thankful for the 6D II's Flicker Detection and corrective shutter timing for avoiding color balancing problems. Who should opt for the EOS 5D Mark III? Even though the 5D III seems to have few benefits over the 6D II, the value of some of those benefits can be huge. For instance, anyone photographing once-in-a-lifetime events such as weddings should likely choose the 5D Mark III for its dual memory card feature alone. While card corruption is relatively rare, dual memory card slots provide a vital layer of protection to keep your (or your client's) images safe. Having images backed up in-camera can help you avoid tarnishing your reputation due to a faulty memory card. Many photographers will appreciate the 5D III's viewfinder with 100% coverage and faster maximum shutter speed. If you already own a 7D Mark II, you will likely appreciate the very similar controls featured in the 5D III, including (but not limited to) the multi-controller joystick. If keeping the 7D II as a secondary camera, you should be able to switch between bodies without missing a beat. Released in 2012, the 5D Mark III still remains relevant in today's camera landscape, although its target market has surely shifted from those needing cutting-edge technology (without stepping up to a 1-series camera) to an enthusiast group wanting full-frame image quality and a more-than-reasonable feature set at an attractive price. And, coincidentally enough, that's a good description of the 6D Mark II as well, although its overall feature set is certainly more contemporary. As illustrated above, each of these cameras will serve specific photographers' needs better than the other. If you or your business can't afford the ill-effects of a memory card failure, or if the 5D III's controls make it a better fit for your photography, the 6D II's advantages will mean little when adding the 5D III to your shopping cart. However, with its higher resolution, Dual Pixal CMOS AF sensor, more than sufficient AF system, GPS/wireless features and smaller design/lighter weight, the 6D II will likely be the preferred choice for a large number of photographers. 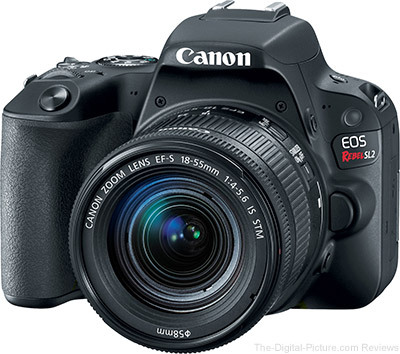 Permalink: Should I Get the Canon EOS 6D Mark II or the 5D Mark III? 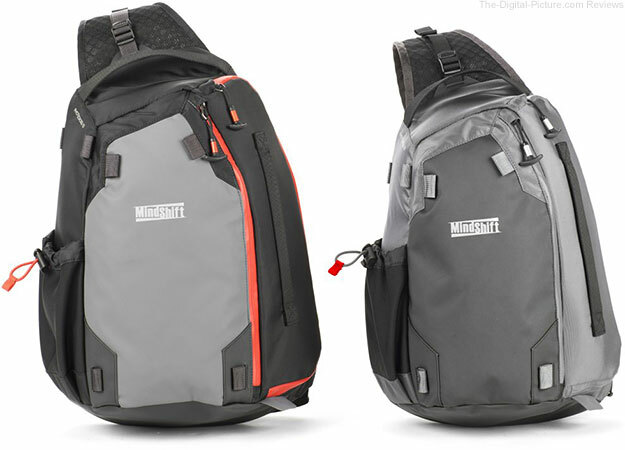 MindShiftGear has the PhotoCross sling bags in stock. The Sigma Corporation would like to announce the development of the rear filter holder for the SIGMA 14mm F1.8 DG HSM | Art for Canon. 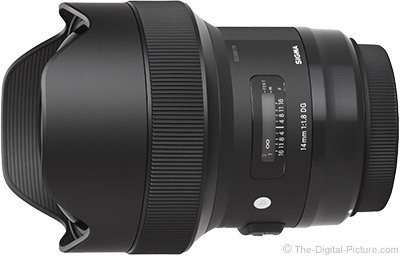 B&H has the Sigma 14mm f/1.8 DG HSM Art Lens available for preorder. This innovative control system uses a Dual MPU design with enhanced computing capacity. The MPUs have powerful, built-in DSP (Digital Signal Processor) blocks that achieve quicker and more precise AF performance, and more consistently powerful Vibration Compensation. The features combine to provide outstanding performance at night and in low light. High performance MPU for AF dramatically improves autofocusing accuracy and speed The A032 is equipped with its own MPU (micro-processor unit), with embedded DSP (Digital Signal Processor) blocks that enable high-speed digital signal processing, achieving both excellent responsiveness to signals from the camera and high-precision AF performance. Should I Get the Canon EOS 6D Mark II or the 5D Mark IV? With the introduction of the Canon EOS 6D Mark II, you may be wondering whether it's an adequate camera for your needs or if the higher end EOS 5D Mark IV is a better fit. Compared to the original 6D, the 6D II goes a long way in closing the feature gap with its 5-series full frame brethren. Now let's take a look at how these DSLR bodies differ. Note: The advantages listed above should not be considered an exhaustive list, but instead represent some primary differences between the cameras. If you are stepping up from an entry level EOS Rebel/****D/***D/**D/7-series camera, the 6D Mark II will offer at least one big feature you didn't have in your previous camera – a full frame sensor. But depending on the model being displaced in your kit, the 6D Mark II may offer a wide variety of feature upgrades that make it an attractive primary camera for your needs, especially for the price. If you already own a recent 1-series or 5-series DSLR, the 6D Mark II should prove to be a great backup camera that's more compact and easier on the budget compared to a new/retail duplicate of your existing camera. And while we're on the subject of the camera's size and weight, anyone who is traveling to remote locations with the responsibility of carrying their camera kit on their backs for long distances and/or long periods of time will certainly appreciate the 6D II's smaller dimensions and lighter weight. Who should opt for the 5D Mark IV? While the 6D Mark II can easily produce professional-looking results from an image quality and AF perspective, its lack of dual memory card slots may make it a less ideal choice for those who are shooting once-in-a-lifetime imagery (think, weddings). And with a more advanced AF system (with more points and more coverage), you can expect the 5D IV to perform a little better in challenging AF conditions or when framing subjects closer to the edges of the viewfinder. If you are primarily interested in video filming with your DSLR, the 5D IV offers more video features – including 4K recording – that will make it a much better option compared to the 6D Mark II. The 6D Mark II represents a huge step up from its predecessor, and its upgraded features along with a budget-friendly price make the 6D II an incredible value in Canon's DSLR lineup. For those that don't require the extra features found in the 5D IV, the 6D II should prove proficient at tackling most photographic challenges with ease. But for those who need an edge in AF performance, dual memory card slots and 4K recording, the 5D Mark IV is your camera. Permalink: Should I Get the Canon EOS 6D Mark II or the 5D Mark IV? The Canon Digital Learning Center has posted some interesting articles on the newly announced Canon EOS 6D Mark II and Rebel SL2 DSLRs. Preorders: You can find the latest preorder retailers here. B&H has the PocketWizard FlexTT6 Transceiver for Canon in stock with free expedited shipping. The Canon USA YouTube channel saw a flury of activity after last night's midnight announcement of the EOS 6D Mark II and Rebel SL2 / 200D. So sit back, grab some popcorn (or more likely for those in North America right now, your breakfast), and enjoy the show. Want even more info? Check out the links below. The Canon EOS 6D Mark II DSLR camera page has been loaded with information, expectations and images. Also available are the detailed Canon EOS 6D Mark II specifications, ready for comparison with your favorite EOS model. Here is the Canon EOS 6D Mark II vs. 6D comparison. This is one of the more-exciting Canon camera releases we've seen recently. I expect this model to become a very popular one. The Canon EOS 6D Mark II is available for preorder at B&H | Amazon | Adorama | Wex Photographic. The Canon EOS Rebel SL2 / 200D DSLR camera page has been loaded with information, expectations and images. Also, learn what "SL" stands for. Additionally available are the detailed Canon EOS SL2 specifications, ready for comparison with your favorite EOS model. Here is the Canon EOS SL2 vs. SL1 comparison. I liked the SL1 a lot and a new iteration of this model with some of Canon's latest DSLR technologies included is great to see. The Canon EOS Rebel SL2 / 200D is available for preorder at B&H | Amazon | Adorama | Wex Photographic. The EOS 6D Mark II DSLR camera is scheduled to be available in late July 2017 for an estimated retail price of $1,999.00 for body only, $3,099.00 with the Canon EF 24-105mm f/4L IS USM II lens and $2,599.00 with the Canon EF 24-105mm f/3.5-5.6 STM lens. 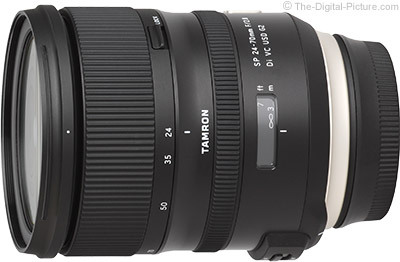 In addition the EOS Rebel SL2 is scheduled to be available in late July 2017 for a retail price of $549.99 for body only and $699.99 with the Canon EF-S 18-55m f/4-5.6 IS STM lens. For more information please visit usa.canon.com. Written by Dave Henry and Ken Sklute A total solar eclipse is truly amazing and is absolutely the most majestic natural phenomenon for earth! That’s right… for earth! It’s nature’s gift to earth. Nothing beats it. Nothing! The thrill, however, began months ago when you decided that you weren’t going to let this eclipse pass you by. After all, it’s the kind of challenge all photographers live for. The challenge that expands our photography skill sets and allows us to photograph something new. Afterwards you’ll sit back and reflect on what it was exactly that enabled you to get such great images and you’ll soon come to the realization that it was all in the planning. That’s usually the case in almost everything we do. It was over a hundred years ago that Louis Pasteur said, “Chance favors only the prepared mind.” What he meant is that a prepared person, with the right skills at the right place at the right time, can take advantage of an opportunity and create something. B&H carries solar eclipse photography gear.